Loosen Your Belt: Chocolate Granola. The Mast Brothers Cookbook. Chocolate Granola. 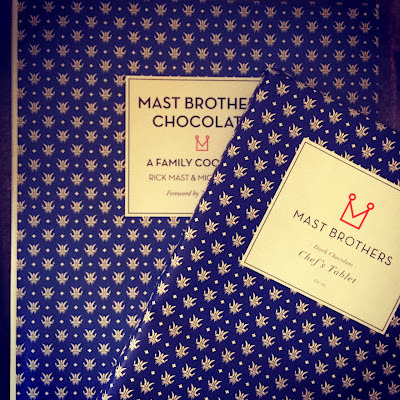 The Mast Brothers Cookbook. 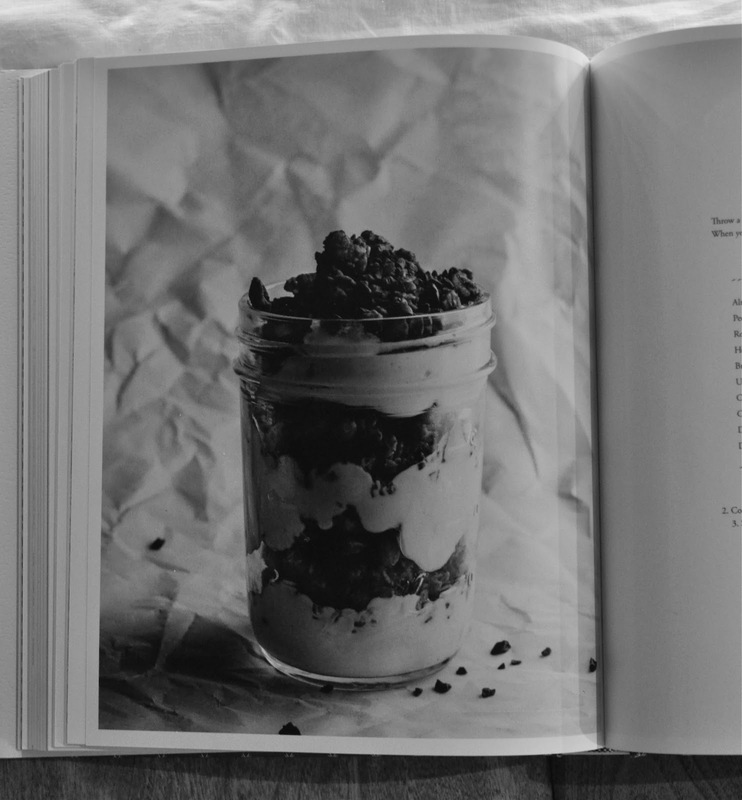 I am loving the Mast Brothers Cookbook. On our last day in New York - also the day of the book release - I walked back to the factory to pick up a copy, and found they had all been signed! It wouldn't fit in my already overstuffed luggage, but it was well worth lugging it across the subway system to the airport. Also, have you seen the cookbook trailer? Adorable. I made the chocolate date cake soon after arriving home - delicious - and marked the chocolate granola for later, soon realizing it would be a perfect give to give coworkers. No last minute baking for me! 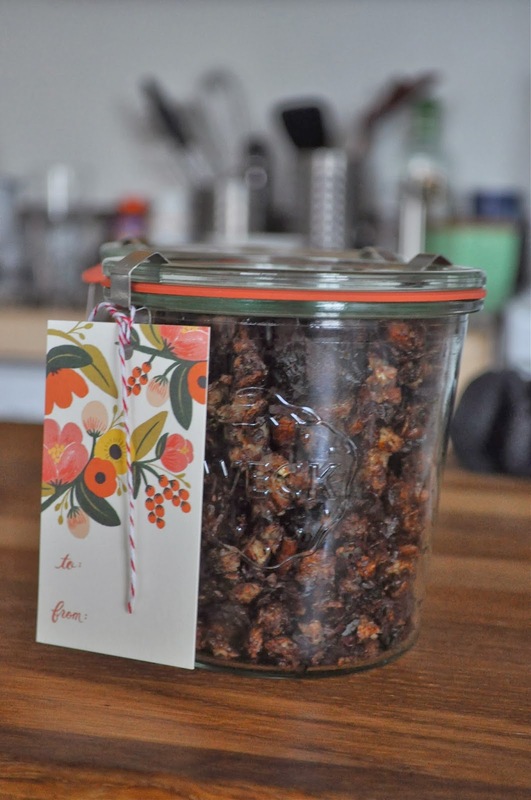 A couple weeks ago I made three batches, scooped the granola into six jars and still had some left to keep around the apartment for breakfast. Win. The recipe is pretty simple - Mix 1 cup each of almonds, pecans and rolled oats with a 1/2 cup of honey and 2 Tbsp brown sugar and place in a 350 degree oven for approximately 15 minutes and let cool. In the meantime, melt 3 Tbsp of butter* with 2 Tbsp cocoa powder and set aside. Combine a 1/2 cup each of cocoa nibs and dried cranberries (or cherries or figs or other suitable dried fruit) with the roasted nuts/oats and stir in the butter mixture. Once everything is cool, mix in 5 ounces of chopped chocolate (I chopped up chocolate from one of the Mast Brothers tablets). *I used the canola oil from Mighty Trio Organics since I wasn't sure when people would be eating the granola. It worked out well since it's so nutty and light. So there it is. Christmas gifts (well, some of them) done. Thanks for the recipe Marianne! I'm Marianne. I eat and drink in Edmonton, and sometimes elsewhere in the world, and have been posting about it here since 2008. Apparently I'm really contemplating that pizza up there... More about me here →. Content and photos belong to Loosen Your Belt (2008-2014). Template by Kotryna Bass Design. Powered by Blogger.